More than ever, cities are the lifeblood of the global economy, and increasingly determining the wealth of nations. Productive policy innovation is taking place in cities, more often than in the halls of national governments or international forums such as the UN, EU and G20. The closer it is to the citizen, the more flexible and practical policy-making becomes. Also, the more experimental it becomes, contributing to all-round learning and adaptation. Cities emulate one another and adopt best international practice better than nations do. Competitiveness hinges on the productivity of the city, its ability to use available inputs to drive sustainable economic growth and prosperity. In the Competitiveness of Cities Report, we compiled 33 case studies of cities around the world – cities with different endowments and at different stages of development. Some are proven success stories, others are potential success stories, while yet others have become stuck or failed. So what did we learn? Urbanization is the “megatrend” that is most relevant to city competitiveness. Never before have urban spaces and populations grown at the speed and scale they are doing today. As of 2010, for the first time in history, more than half of the world’s population lives in cities. But they already account for over 80% of global GDP. According to the UN, an extra 2.4 billion people around the world will urbanize by 2050. For the foreseeable future, rapid urbanization will be almost exclusively a non-Western affair: 94% of those who move to cities in the next few decades will come from the developing world. McKinsey Global Institute estimates that, by 2025, the developing world’s top 443 cities will account for close to a half of global GDP growth and 18% of global GDP. These cities will contain the bulk of about 1 billion new middle-class consumers. 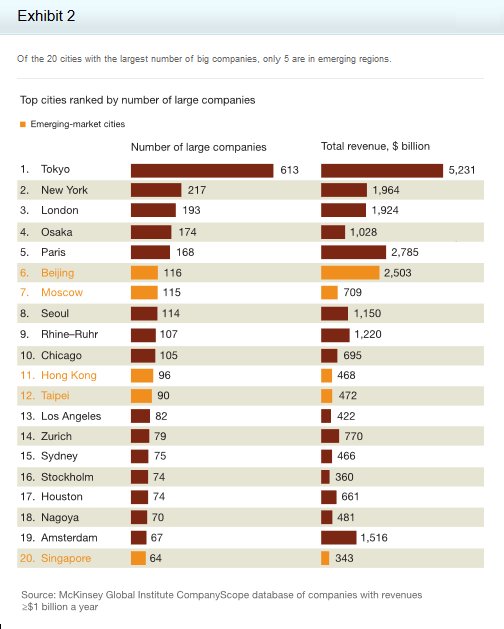 So what are the key lessons for city competitiveness? We offer a checklist of four items, which constitute our what-to-reform, how-to-reform agenda. 1. Think institutions, the decision-making framework of the city. Leadership and vision (a clear, farsighted view of where cities should head, and a single-minded practical will to ensure they get there) show the power of city leaders as CEOs. Lee Kuan Yew in Singapore, Sheikh Mohammed in Dubai, Sergio Fajardo in Medellin, Colombia, and SR Rao in Surat, India, are stellar examples. Singapore highlights the importance of gradually building up institutional strengththrough successive phases of development. But Monterrey in Mexico and Cebu in the Philippines point to fragile institutions that can endanger existing gains as well as future competitiveness. Cities should also look out for windows of opportunity– often during a political or economic crisis – to push through a critical mass of decisive reforms. This is what happened when Singapore was kicked out of Malaysia in 1965, and when Surat was stricken by plague in 1995. 2. Think of the regulatory framework for the city’s business climate. “Getting the basics right”– stable and prudent fiscal policies, including low and simple taxation, a flexible labour market, openness to trade and foreign investment, simple and transparent business regulation – is the primary lesson for good public policy, at both national and municipal levels. Cities should develop their own foreign economic policies on trade, foreign investment, tourism and attracting foreign talent, and go global as far as they can. Singapore, Dubai, Hyderabad and Ahmedabad in India, and Ningbo in China are great examples. 3. Think “hard connectivity” – the city’s core physical infrastructure. Cities need a mixture of planning and organic growth, which are complements, not substitutes. Manhattan is a great example with its street grid and room for organic expansion over the past two centuries. Brasilia, Chandigarh in India, and many Chinese cities today are counter-examples of overplanning. Next, urban density, including “building tall” in city centres, is preferable to urban sprawl. Hong Kong and Singapore are great examples of urban density, as is Chicago in recent years. 4. Think “soft connectivity” – the city’s social capital. Education is the ultimate form of this. US cities such as Boston, Pittsburgh and St Louis have escaped post-industrial decline and specialized in knowledge-intensive niches by capitalizing on their strengths in education. Next, cities need to facilitate digital infrastructure to support human-computing interfaces that empower individuals. Also, making cities more liveable – improving the quality of urban life – must be a higher priority for upper-middle-income and high-income cities. Wroclaw (Poland), Leipzig (Germany), Busan (South Korea) and Curitiba (Brazil) are good examples. The renowned urbanist Jane Jacobs said that successful cities are those that are flexible and adapt quickly to changing conditions. That is borne out by the success stories mentioned here. The alternative is to become stuck in mono-industrial, monocultural decline, such as happened in Detroit. The right mixture of priorities requires tailoring to specific conditions and stages of city development. Most obviously, priorities for a Western city with a stable population, facing sluggish growth, unemployment and ageing, will be quite different to those of an emerging-market city with lower income levels, high growth potential, a fast-expanding population and big gaps in infrastructure. 5. Reforms at the municipal level are usually more feasible than at the national level, even when they seem impossible in national capitals. Urbanization trends enlarge these possibilities. Cities should grasp this opportunity, experiment with new rules and put reforms on a fast track. Author: Razeen Sally was chair of the World Economic Forum’s Global Agenda Council on Competitiveness in 2013-14 and coordinated its new study on the competitiveness of cities.